Marissa Lopez came to Headpiece.com in July of 2017. She had lovable energy, innate creativity, and a unique vision for her bridal accessory designs. I would later find out what a real "sweetie" she was. Her story made this design experience one I will remember for a lifetime! Everyone at Carlo’s Bakery knew about the proposal for months and were all in on the plan. Corey dropped Marissa off at the airport for a work trip to the Orlando store. First, Marissa attended a Tampa Bay Rays game to give out an autographed chef jacket to the winner of a competition held in between innings. The stadium directors helped Marissa onto the top of the dugout at the beginning of the 7th inning while Corey snuck up behind her. She turned around, and much to her surprise found Corey on one knee. After the proposal, they were ushered to a private suite to watch the rest of the game and enjoy some champagne. When Marissa opened the door, she was shocked to see both of their families had flown in to celebrate. Marissa’s sister, Gina Lopez, snapped some great engagement pics. Marissa's wedding date was the most popular wedding date for my clients in all of 2017. It was Friday the thirteenth...and also the day before my own daughter's wedding! Save the date cookies, handmade by Marissa, look too pretty to eat! Marissa applied not knowing that she was trying out for a show starring the Cake Boss. At the start of Season 2, Marissa received a call from casting that she should re-apply. Marissa knew she wanted a lace wedding gown. It was essential that her dress had a finished look. She shopped unconventionally and chose her wedding gown by considering the details from the bottom to the top. Marissa describes herself as “bridal obsessed”. She is an Instagram fanatic and came across @headpiececom. Marissa came to me knowing she wanted a hair brooch. She only knew she wanted it “not too big, not too small.” After meeting with her for just a few minutes, I found she was a lace-lover. I showed her a beautiful brooch I designed that incorporated a touch of French lace. We added and subtracted design elements to come up with something unique and perfect. Adding a tiny hand gathered silk organza flower and bud to the design gave Marissa the extra pop of dimension and texture she was hoping for. When it came to Marissa’s veil design, length and shape was a top priority. Once she tried on our soft, silky European net, we found our starting point. Narrow French lace detailing worked subtly with the beautiful lace tiers on her skirt back. I was specific on the measurements I wanted to ensure her veil design would follow the silhouette of her gown and hit the points I wanted on the back of her dress. So I gave the Next Great Baker a homework assignment to do. I did a quick sketch of her dress in her wedding notebook and asked her to fill in the blanks. I was going crazy at the shop designing my dress for my daughter’s wedding and completing all of the creative details and decor for her Richmond, Virginia wedding on October 14th. The last few weeks of September were nuts considering I had so many clients to complete before I left for Virginia. Marissa’s designs were the last to finish before “our” wedding days! Her brooch came out precisely as our two creative minds envisioned. I left for my daughter’s wedding knowing that everything was perfect for Marissa…and that she was in the best of hands. 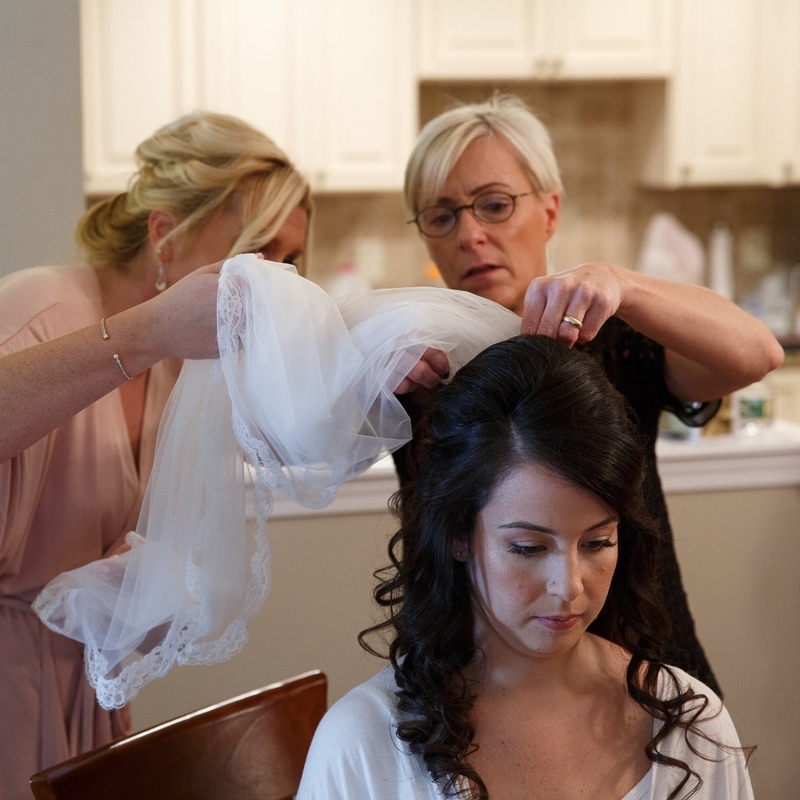 Lia, from Bliss Salon in Towaco, N.J., has styled for many of my brides. Her down styles are beautiful and natural. Veil placement is so important to me as a designer. I always go over it with my clients when they come to pick up their finished designs. We don’t just hand a bride her veil and say, “Thank you for your business.” We pay attention to every detail and even study the hairstyle to make sure our designs have every custom loop needed for bobby pinning in the proper places. Nuggie flower girl pics are a favorite of mine. Kisses for the bride are a must on her wedding day! Wedding day perfection! This is my favorite wedding pic of Marissa and Corey. Her bridal veil mirrored her shape. The bottom of her veil finished at the precise spot I had calculated—exactly halfway down the top lace tier of her skirt. This blog is not solely about our bridal accessory designs. It is about the creative mind and what stems from it. There is something very special about working with a client with creative talent. When Marissa walked into Headpiece.com we spoke the same language. Just hers was a bit sweeter than mine. 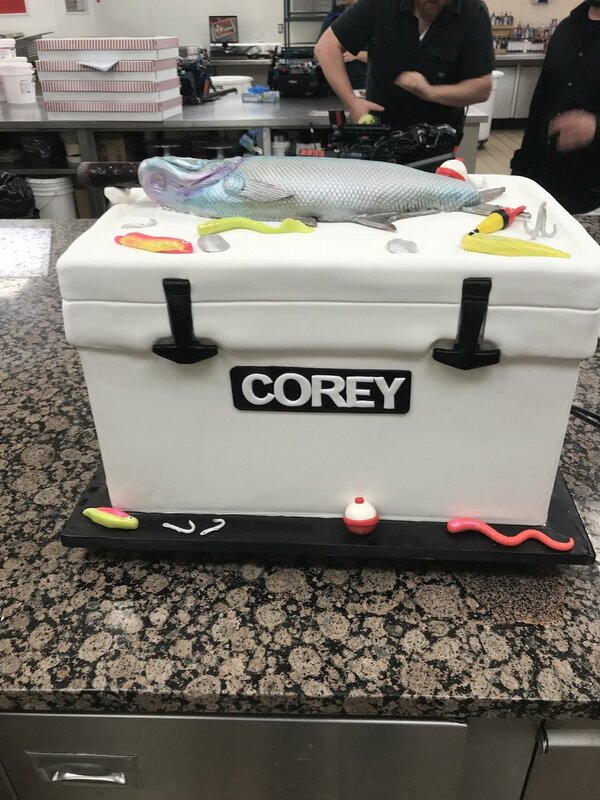 Marissa surprised Corey with a specialty groom’s cake. He loves to fish and smoke cigars so what’s better than a cigar-smoking fish cake. Corey absolutely loved it! How could he not, when he is married to the Next Great Baker? Our followers might be a bit shocked that Marissa designed her wedding cake just one week before the wedding. The Cake Boss shares the real story behind Marissa and Corey’s cake (s). After looking through Marissa and Corey’s wedding pics and writing this blog, it became clear how important cake is in their relationship. I find we have circled back to where this love story and blog began. Only this time Corey is a bartender for life! The sweetest part of this story happened at the end. Two days after the wedding, Marissa put on her wedding gown and veil, and Corey put on a well tailored suit. They went to see a very special guest who was unable to attend the wedding. It was Marissa’s Grandma. Marissa’s “something old and something borrowed” was her grandmother’s ring. For as long as Marissa could remember, her grandmother wore this ring. When I asked Marissa to participate in our blog, she said yes with enthusiasm. She stopped by the shop to share some stories and have some laughs. One thing I love about my bubbly bride is how important every detail of her wedding day was to her. She has said again and again how much she would like to do it all over again. Marissa came fully equipped for her visit to Headpiece.com. 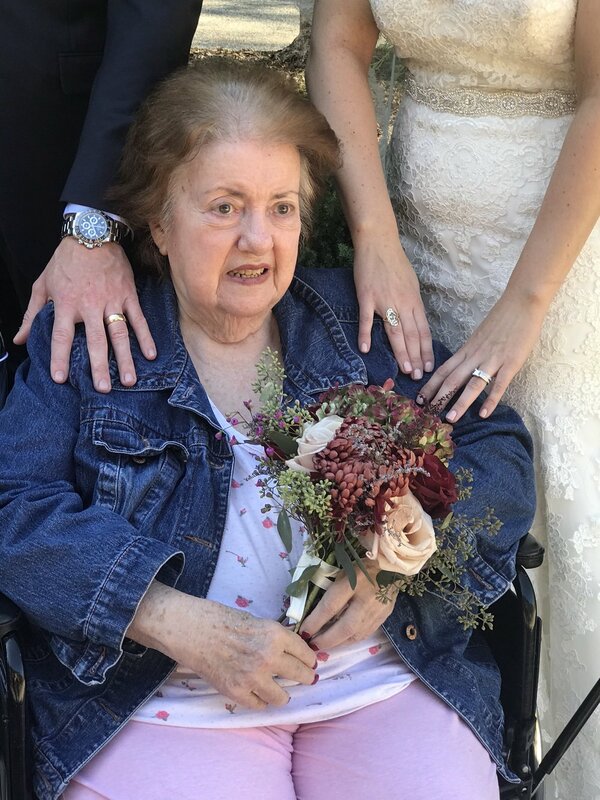 She brought her bridal brooch and wedding veil and told me how she has worn it while doing laundry and even baking a turkey on her first Thanksgiving with Corey. I took her in the back room and pressed her lace veil once more, so it was as beautiful as it was on her wedding day. Buddy got a great girl to join the Carlo’s Bakery famiglia! For me, Marissa will always be one of my Headpiece.com daughters. I am sure her fun-loving personality is one of the things Corey and her 69.4K Instagram followers love about her! 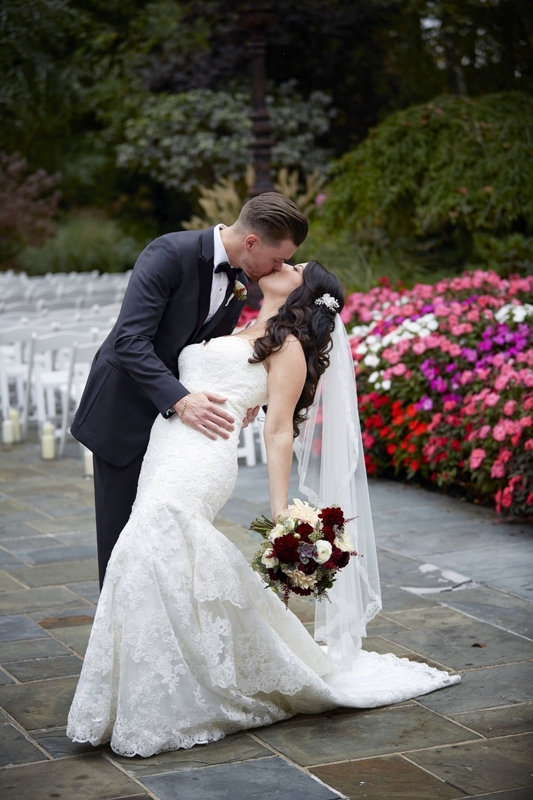 Thank you, Marissa, for sharing your incredible wedding day and Cake Boss adventure with our followers. AND…yes, those cupcakes taste delish!